PAROC XGF 002 concrete curing mat is an insulation mat to be used in winter casting of concrete slabs. The mat is made of closed cell polyethene cellular plastic. After concrete casting the new concrete is protected with the concrete curing mat as soon as possible to prevent freezing. 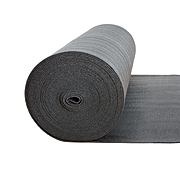 The friction-coated surface prevents the mat from sliding out of place. The mat has good resistance against chemicals and oil.